CloudWATCH2, Think Cloud Services for Government, Business and Research, launched on 1 September 2015, which leads on from the successful CloudWATCH project which finishes on 30 September 2015. Building on the success and outpus of CloudWATCH, CloudWATCH2 takes a pragmatic approach to market uptake and sustainable competitiveness for the wider uptake of new cloud services and products from European research and innovation initiatives. Running until August 2017, CloudWATCH2 helps R&I initiatives to overcome challenging issues like standards and pricing to maximise the socio-economic impact of this new cloud ecosystem. One of the objectives of the Digital Single Market Strategy is creating long-term growth potential. Europe needs a digital market that allows new business models to flourish, start-ups to grow and industry to innovate and compete on a global scale. The European Commission’s programme for Software, Services and Cloud gives companies and research institutions the freedom to innovate technically in cloud computing. This is how European research and innovation initiatives bring continuous improvements and deliver services and solutions with increasing value for the digital single market. For European industry and citizens to make the most of the digital economy we need to tackle the most challenging issues. In the cloud R&I space, these challenges include issues such as standards, transparent pricing and better uptake of new services. European Research and Innovation (R&I) projects need to think strategically, looking at technology and pricing as part of the same equation. While challenging, interoperable cloud services play a very important role in extending the market and in bringing business benefits to both the supply and demand sides. Results from projects need to have an impact on the market if they are to become truly sustainable. This is where CloudWATCH2 comes into play. CloudWATCH2 brings together highly specialised experts in standardisation, security, legal aspects and pricing to help ensure European R&I takes to market the best possible products and services. Ultimately, this has significant benefits not only for small- and medium-sized enterprises (SMEs) but also public services. CloudWATCH2 takes a pragmatic approach to market uptake and sustainable competitiveness for wider uptake and commercial exploitation. It provides a set of services to help European R&I initiatives capture the value proposition and business case as key to boosting the European economy. A cloud market structure roadmap with transparent pricing to enable R&I projects to chart exploitation paths in ways they had not previously considered, or help them avoid approaches that would not have been successful. Mapping the EU cloud ecosystem of products, services and solutions emerging from EU R&I projects. Identifying software champions and best practices in mitigating risks associated with open source projects, and ultimately, enable faster time-to-value and commercialisation. Concertation for clustering and convergence on common themes and challenges. Re-use of technologies will also be of paramount importance. Promoting trusted & secure services through roadshows and deep dive training sessions. Giving R&I initiatives a route to users at major conferences or in local ICT clusters. A portfolio of standards for interoperability and security that can facilitate the realisation of an ecosystem of interoperable services for Europe. Cloud interoperability testing in an international developer-oriented and hands-on environment. Findings will be transferred into guidance documents and standards. Risk management and legal guides to the cloud for private and public organisations to lower barriers and ensure a trusted European cloud market. Industry 4.0 is about digital innovation in products, processes and business models. 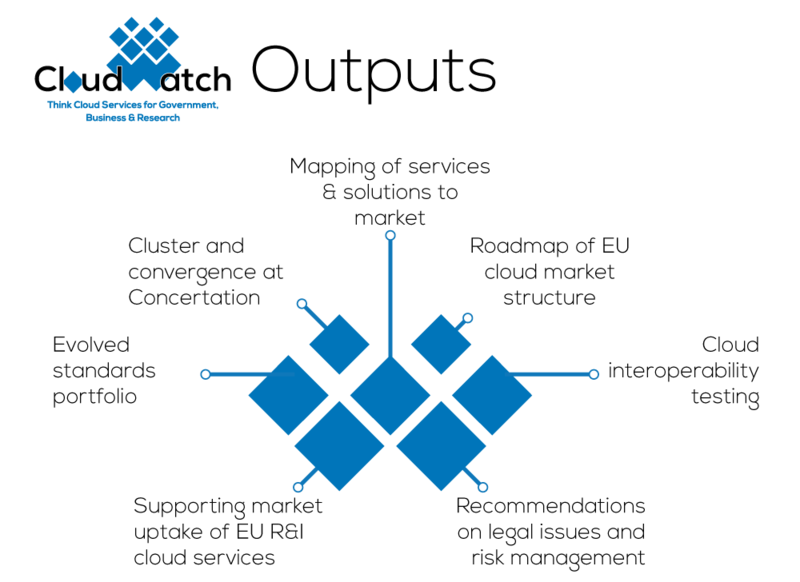 CloudWATCH2 provides a set of services to capture the value of European R&I initiatives in the digital single market and ultimately benefit Industry 4.0 as a central pillar of the European economy. Europe must innovate at the technological level and demonstrate tangible business value. CloudWATCH2 services will play a key role in this. Firstly, by showing how the market can become more efficient, more competitive and bring savings to consumers; and secondly by supporting EU R&I projects to think strategically and look at technology and market uptake as equally important.